The NASDAQ as well as the overall stock market has been in a secular bear Market since 2000. However, from early 2009 to the present the NASDAQ has been moving upward in a bear market correction. It is now time for this correction to end and the bear market to resume. 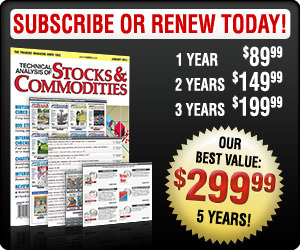 You must be a registered member of STOCKS & COMMODITIES magazine to read the article you’ve requested. Simply fill in your name and address and submit this form to us to receive your FREE TRIAL subscription to STOCKS & COMMODITIES. This will begin your trial subscription at the special introductory rate of only $89.99 for 1 year. You will receive a trial issue of the magazine in the mail and also be able to access a sample digital issue of the magazine online in our subscriber area. In addition, you will have access to our online publications Working Money and Traders.com Advantage for 30 days!. Your log-in information will also be provided via the Email address you submit with the form below. If you are not satisfied with your sample issue of Stocks & Commodities magazine, just return your bill marked �cancel� and owe nothing. The sample issue is yours to keep!